This is not just another write-up themed on emerging BI trends. Our approach is more real-time, a result of real interactions with industry leaders, innovators, Big Data influencers and experts with whom we regularly interact, just like our participation at the Channel Partners awards. Why are there barriers to BI? Despite a strong belief that Business Intelligence, particularly when fueled by analytics, should create engaging ROI, this particular category of Big Data spending witnesses sporadic traction trends. The big reason lies in apprehension in the minds of decision-makers. The evolution of Big Data and other technologies has made them realize that their ecosystem is about being virtual, collaborated and centralized substantially to ensure better outcomes. BI is the tool for achieving these capabilities. It provides contextual, consolidated data for formulating policies and making crucial business decisions. BI vendors are well aware about the rising demand for insights derived out of business data and are developing services that make sense for enterprises. This is evident from the launch of updated products like SAP Business Objects intelligence 4.0—now compatible with Hadoop and with extended support for HANA. We are betting big on an increased appetite for Advanced Analytics to dig deeper into consumer mindsets, reasons for fluctuating brand loyalties, hidden sales channels, and finding new approach for Data Governance. A combination of data, analytics tools and algorithms will be used by analysts to improve deployment time and data insights, despite a dearth of data science. Advanced cloud authoring capabilities with potent graphics are required for deriving faster insights, so the focus will be on tools that can cater to such needs. Yes, digitization of data is becoming a norm—the US healthcare sector is a thriving example of this but all virtualization platforms are not created equal. 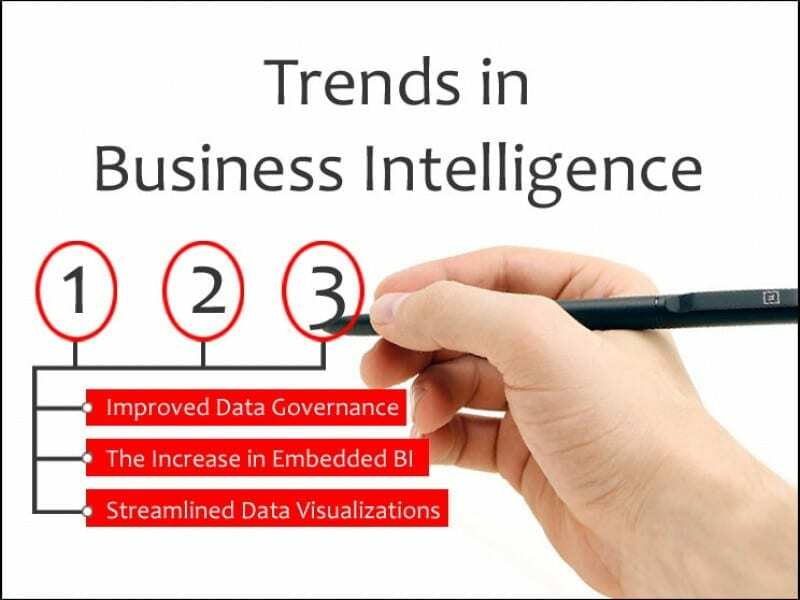 The emerging BI domain will need smarter data engineers. This needs professionals who understand original sources of data streams and endpoints of data consumption and accordingly, can create agile virtualization tools like centralized dashboards. Creating such aggregated, browser-based virtualization platforms means ease of managing virtualized data. Simplicity breeds better outcomes in any Big Data setup. Customizations too can be added like Snippets that prompt throughout the journey of a data set. This means more accountability for data processing and shareability. The best way to explain this is by quoting the ATM—a smartly designed machine that dispenses depending upon the user’s inputs. It has strategic control systems to ensure user data is not breached. The dispensing tools are frequently upgraded to ensure better user account management. Today ATM machines have evolved from being simple money dispensing tools to a full account management terminal. Experts are predicting similar evolution for the self-service BI as will move beyond the self-service for analysts, extending to the masses through purpose-built apps. The BI information will be delivered to the masses using the latest tools and interfaces. Industry influencers insist that senior managers will have to let go of authorizing every request to access privileged data. Self-service BI models are intuitive, driven to perform as per user request without compromising data privacy or security. With automated functionalities, employees or outsourced analysis teams can access data via a centralized interface. 3. Data Everywhere = Increasing Room for BI…Everywhere! Big Data thrives on collating data. From social media interactions to online reviews and information shared with business partners, data streams are diversifying, creating more silos. This means more business-related data will not only be used for deriving meaningful insights but it will also create more room for BI tools to monitor data journeys—usage, access, shareability and warehousing. Today’s BI fabric is embedded in every aspect of enterprise, from in-house teams to remotely located consumers. This means more operational data, tactical, more likely to catalyze strategic decision-making. Business Intelligence will lead the way in fighting your way through the deluge of data that is already overwhelming many businesses. With Internet of Things growing bigger, expect more data pouring from an increasing number of devices. Such data streams will need to be filtered using advanced analytics to ensure usable data makes it way to the final report. 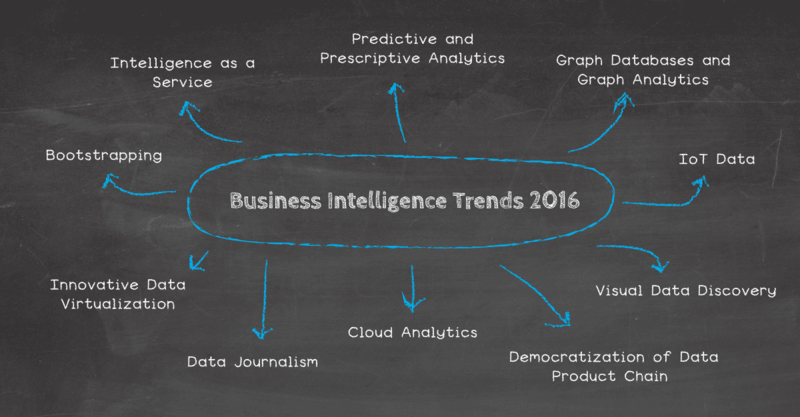 2016 will see more BI tools to analyze data in real time. Business Intelligence tools that can be used for driving analytics form connected devices will thrive and predictive capabilities will prevail. As IoT gains momentum in 2016, enterprises will depend on quicker deployment of new API infrastructures and we expect these to become an inherent part of all IT-driven enterprises. This year, more & more enterprises have started relying on software-as-a-service to either replace or complement their existing applications. Since, mobile-based applications are dominating the marketplace, there is an increased need for Cloud connectivity and APIs that are basically focused on advanced developer tools. The idea is to create a more actionable business intelligence set-up, easy to integrate with vital, on-premise software systems. BI solutions providers will be challenged with a wealth of information that has to channeled towards driving sales and delivering better outreach and engagement outcomes. Expect more humanized, easier-to-use apps demanded by sales and marketing teams. We are sure that 2016 will witness newer technologies capture the spotlight in the unfolding BI ecosystem. Faster-to-market demand will mean discovering gaps that will be filled with BI solutions. We are expecting more Hadoop accelerators into the equation. Enterprises are realizing the shift away from inflexible platforms and embracing flexible, open stacks that that will be employed by BI teams. This means increasing pressure on BI developers to create solutions that are more insightful.